Snapper, the producer of the Snapper lawn tractors, took a leap into manufacturing lawn tractors in the 1950's. Does your lawn need just any tractor? No. Go for the Snapper lawn tractors. Some lawn tractors make so much sense that you can hardly stop yourself getting aboard and get rolling. It holds very much true for the world of Snapper lawn tractors. Snapper tractors have been designed for highest quality and power with the type of the features that gets the job at hand done the way you want it to be. The type of terrain, the sullen weather or the altitude, there is just nothing that could compromise its efficacy by obstructing the operation of the Snapper lawn tractors when they are on the move. Below categorized are the technical features of the Snapper lawn tractor. Engine options - 19 HP Kohler Courage single cylinder overhead valve 4 stroke engine - 22, 23, 25 HP Kohler Courage twin cylinder overhead valve 4 stroke engine. Transmissions Hydrostatic Deck Options includes easy removal decks, triple option (Mulch, side discharge, rear bag) as accessory package available on most models, 38" deck (2blade), 42" deck (2blade), 46" deck (3blade),50" deck (3blade), 54" deck (3blade), setting the deck height -manual turning radius - 14" - 18" depending on model, power take off (PTO) manual and electric. Accessories includes the cruise control (standard), dozer blade, front end utility bucket, rear bag, mulcher, snow thrower and snow cab. Snapper, the producer of the Snapper tractors, took a leap into manufacturing lawn tractors in the 1950's. The Snapper product line, since then, has been both extensive and impressive in scope. Snapper's vision has always been to excel in its technology, while maintaining its exquisiteness in the line of lawn tractors. Starting with a mid range priced model, the line extends into the very best lawn and garden tractors available in the market these days. Well, mainly for the Snapper lawn tractors, they accompany the '3 in 1' feature option, allowing for side discharge, mulch, or rear bagging. A small lever lets you adjust the deck cutting height manually. The front axles on all Snapper lawn tractor are constructed out of cast iron. This is portrayed to be the toughest and most reliable material in the market, for the front axle of a lawn tractor. Coming to the deck design, all the Snapper lawn tractors are made up of the 'step through' design. This little technicality here assists to thrash any obstructions might come in front of the mower thus hindering its mowing operation. This also lets the driver to achieve an easy entry and exit off the tractor. The snapper lawn tractors let you have the agility you desire. It lets you cut around sharp edges and corners of your lawn besides trimming close to the landscapes with much comfort and ease. The design of the mower deck builds a powerful airflow which helps lift the grass blades thus ensuring an even cut and dispersal. Basically, Snapper lawn tractors are classified into 2 broad categories - lawn tractors (designated "LT") and Garden tractors (designated "GT"). The LT models are numerous, and include 6 categories including the LT 100, LT 125, LT 130, LT 200, LT 300, and LT 400. There are 2 GT models available - the GT 500 and GT 600. The LT series of the Snapper lawn tractors offers you a choice between a kohler twin cylinder 25HP engine and the single cylinder Briggs and Stratton 18.5 HP single cylinder engine; twin cylinder Briggs and Stratton twin cylinder engines (20, 23, or 24 HP). All engines less the 18.5 HP engine contains a pressurized oil system fitted with a replaceable oil filter. 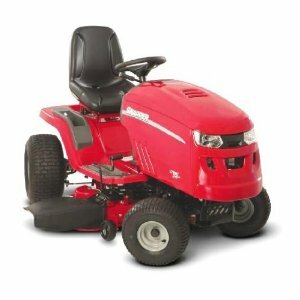 Well, given the unique features, incorporated with innovative and sophisticated engineering, the Snapper lawn tractor just seem to be the most prudent choice for your garden. It has a vast range of lawn tractors, with versatility incorporated into each model. Snapper lawn tractors may be the first tractor in your neighborhood with which you can easily envious your neighbors, but as your gardening peers start to see the magic of it while you roll with it, they would definitely envy you and want to get one just like you. So wait no more to have your lawn to be the 'talk of the town'.